Hello Katie Girl: Toned Down, but Still Turned Up! Toned Down, but Still Turned Up! In addition to being drawn to toned down neutrals, I am also loving a few styles of bags that seem to be all the rage right now. The first type of bag that I am obsessed with is the circle bag, which is so clean and modern in its design that I wonder why this style is just now becoming popular. Secondly, I am obsessed with the camera bag style. I have bag number 5, the Rebecca Minkoff Sofia Cross Body, in a slightly different colorway and it has turned out to be one of my all time favorite bags. Last of all, there's the classic tote, because, well, it's a classic! The totes I selected below, however, all have a cross body strap, which makes them very practical too. (See, there's that practical thinking thing again!) Below you will see a section of my favorite new bags in a variety of practical colors and styles. The only problem is choosing which one to get. But then the impractical side of me says to just get them all! Although I tend to be a "use the same bag every day" type of gal (so boring, I know!) I have been itching to get another one, especially one that I can use on weekends when I don't need my big tote I take to work every day. Love your picks--I think I need that Rebecca Minkoff one too! 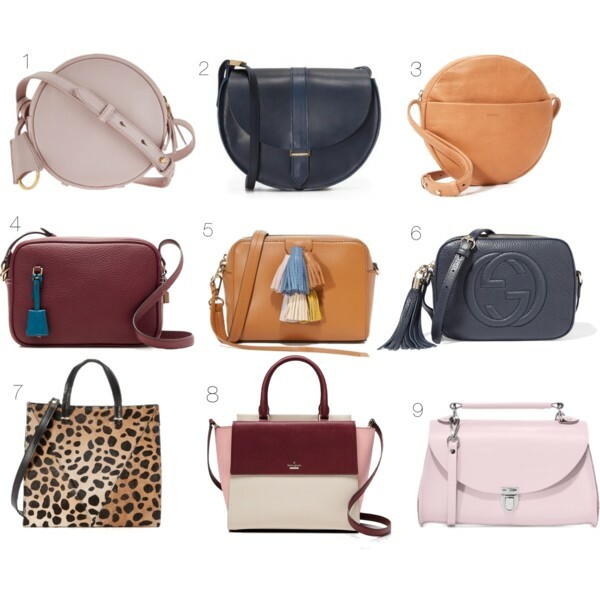 I tend be buy bags in neutral colors, so I am loving all of your picks! That Rebecca Minkoff bag is too cute! Great round up of bags. I love the last 3, especially the leopard print one. Thanks for linking up with me On the Edge of the Week. Great choices! My faves are numbers 4 and 8!